It's an expensive board with an interesting OC dial. 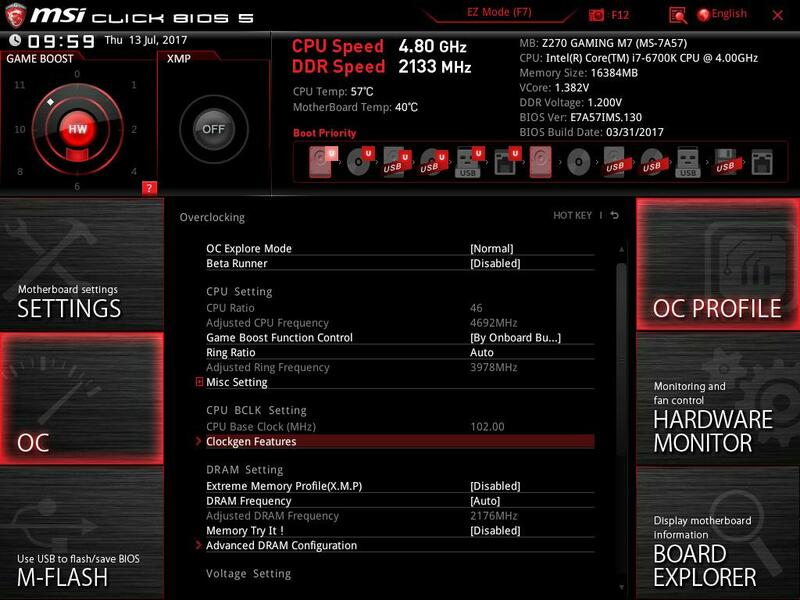 But some key features are gimmicky and similar (non-enthusiast) overclocking performance can be had for less money. We usually eschew overclocking-focused motherboards in order to focus on decent boards which just plain work. 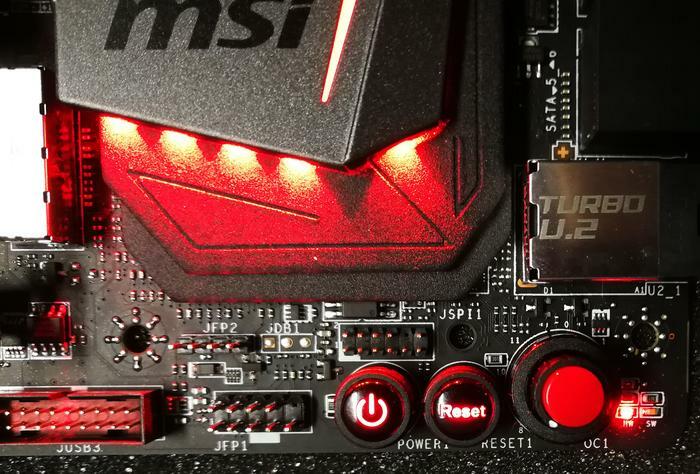 But MSI’s Gaming M7 board has turned our head. While competitive overclockers won’t care about all the automatic overclocking features that come on this board (they’ll do it all manually) being able to ramp up performance just by turning a dial – which actually goes up to 11 – is enough to capture the attention of any non-overclocking computer enthusiast. But only for so long. As usual with our motherboard reviews, we won’t focus on intricate competitive overclocking BIOS-tweaking performance settings – there are plenty of sites which do that. But we will tell you whether this board is worth buying. It’s expensive but it is (at least notionally) packed full of features. So is it worth your money? MSI Z270 Gaming M7 Socket 1151 motherboard (F7a BIOS), 4GHz Intel Skylake i7-6700K CPU, 2 x 8GB Corsair Vengeance LPX 2400MHz C16 DDR4 RAM, Samsung 960 Pro M.2 hard drive, Corsair H80i v2 Hydro Series CPU cooler, Corsair Platinum Series AX1200i 1200W Digital ATX Power Supply, Nvidia GeForce GTX 1070, Windows 10, Dell 2715PQ monitor. There’s a great deal of heat-dissipating armour covering the M7 and there are many RGB LEDs embedded within them. One of the more novel features is a heat shield for one of the (generous) three M.2 drive slots. The shield raises some concerns though – it looks more like an insulator than a heatsink and at least some reports are measuring it actually increasing temperature. 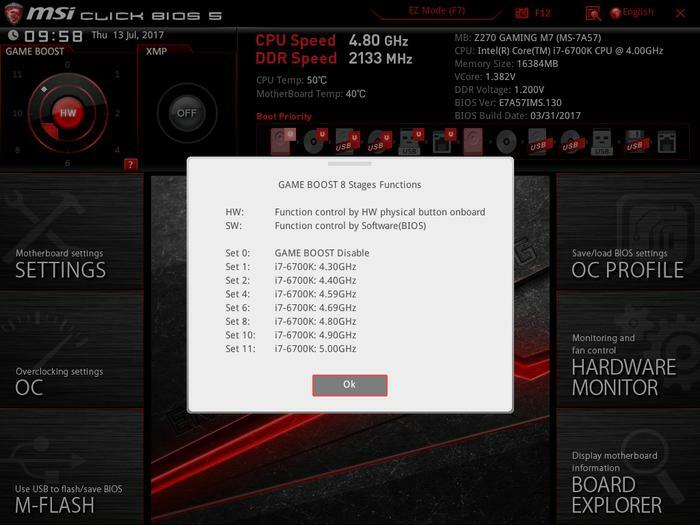 The key feature has to be the “Game Boost” overclocking dial which has eight settings that go up to 11. When you’re in the BIOS, changing this dial will adjust settings to (potentially dramatically) tweak performance. It offered to push our 4GHz Core i7-6700K all the way up to 5GHz (and an i7-7700K up to 5.2GHz) but after a great deal of testing, including using very-high-end RAM, we couldn’t get our chip past the 4.6GHz that Gigabyte manages on its boards with one click. The red button on top of the dial allows for On-The-Fly overclocking of 0.3 to 0.4GHz from stock speeds depending on your chip. However, why people wouldn’t simply leave it higher in the first place is beyond us. It’s all fun for a while but once you find the limits of your kit, only minor manual tweaking will push things any further and you can do that on much cheaper motherboards. MSI Game Boost Dial... goes to 11. The Question Mark icon tells you what each dial number translates to. Next to the dial is a BIOS reset switch plus an on-board power button. There’s also a digital display which shows Post Codes on booting and then the CPU temperature later on. We approve. A digital display shows Post Codes on booting plus Temperature when in Windows. Some of the PCIe and SATA lanes are shared so if you’re planning on loading the board up with storage it’s worth checking the manual which describes the optimal configurations for various combinations of cards and drives. Also of note is the dual ALC1220 audio chips which provide dedicated audio for both front and rear connections – a set-up which sounds better on paper than when listening in the real-world. There’s also a “VR Boost” port which isolates VR usage so that other USB devices don’t interfere with it. MSI claims that this “reduces nausea” but in reality it’s unlikely to make any perceptible difference whatsoever. More discussion on that, here. Something we do like is the Flashback+ BIOS restore button which will re-flash the BIOS by plugging in a USB drive. As we saw recently with the Gigabyte Aorus Z270 board, USB at the rear is a bit of a mess. There are seven USB ports with 3 x USB 2, 2 x USB 3.1 Gen 1 plus 2 x USB 3.1 Gen 2 ports, one of which is Type-A and one is Type-C. There’s also a 20-pin USB 3.1 Gen 2 header on the board. Of the myriad bundled apps and utilities, our heads were turned by a 'RAM disk' builder and Optane Memory configurator. Many of these can be performed by third party apps but having hardware support can boost efficiency. There’s a list, here. Beyond that, the UEFI BIOS itself is well featured and straight forward to use. You can also save six different manual overclocking profiles if that’s your thing. There’s even a handy screenshot button! 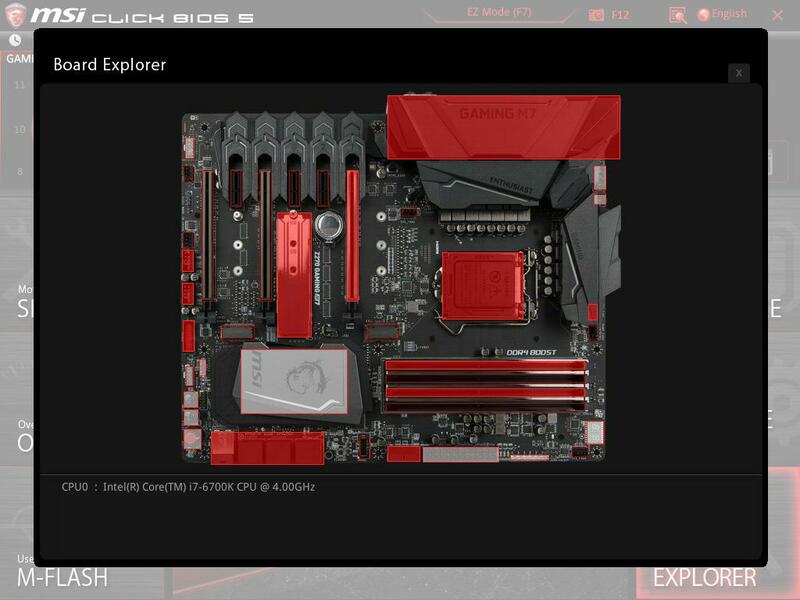 MSI's UEFI BIOS is well laid out and simple to understand. The Board Explorer screen shows you what ports are available and what (if anything) is plugged into them. 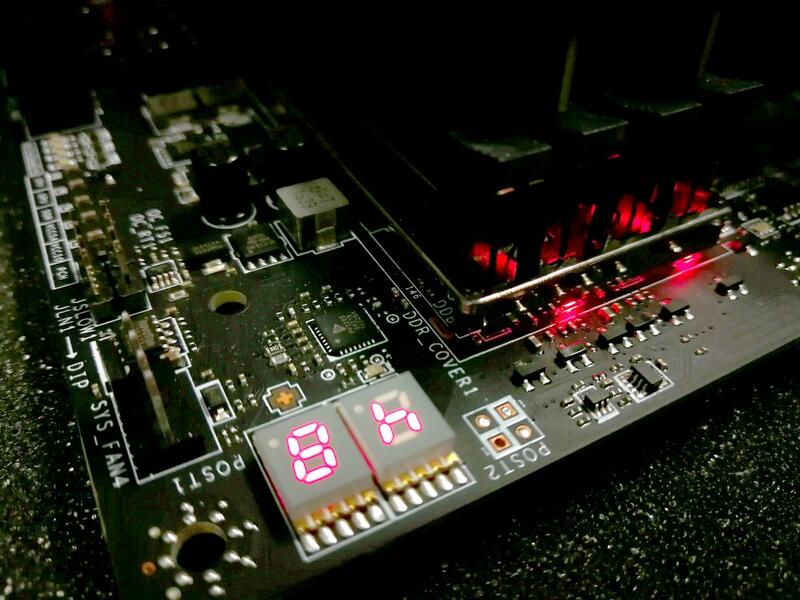 The Game Boost dial makes automatic overclocking simple and offers a large performance envelope if your components can take it. In the end, however, we tested using our 4GHz Skylake Core i7-6700K at stock speeds and at 4.6GHz (the maximum stable speed it could take). It almost completed PC Mark 10 at 4.7GHz but kept crashing part way through. We could get it to boot at 4.9GHz but not for long – even when using our 3600 HyperX and Corsair Dominator Platinum kits. We tested using PC Mark 8, PC Mark 10 and 3D Mark Time Spy. 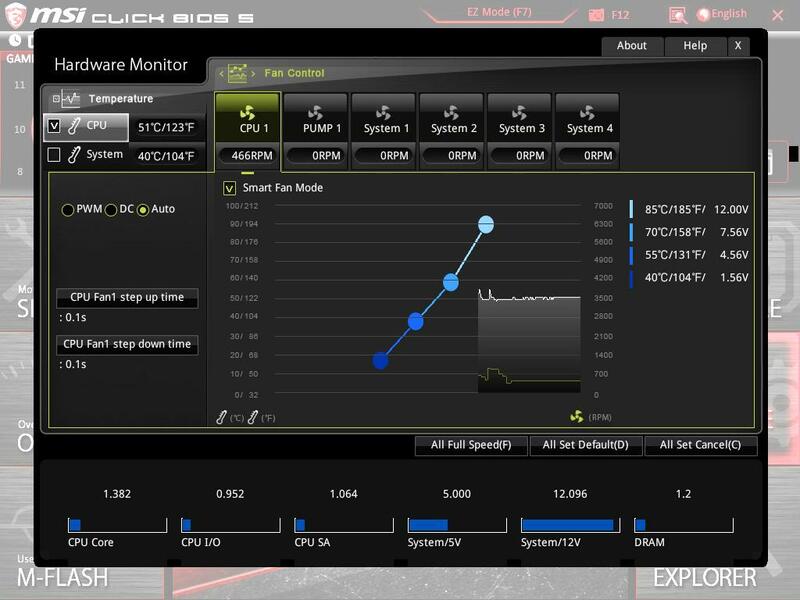 Performance was in line with what we’ve seen from other boards running with these components although the overclocked performance using PC Mark 8 was some 200 points higher on the M7. All in all, these scores are a little higher than we’ve seen elsewhere but not enough to make significant improvements in most applications. We had some fun testing this board, but once we’d established the limits of its performance with our components we found we were in a similar performance space to the Gigabyte Aorus Z270X-Gaming K5 that we tested recently – and that costs a full $100 less than this $369 beast. If you know you’re going to use all the features (and keep on using them) then there’s value here. Also, if you have high-end components and are keen to do some serious overclocking without spending silly money, then this could also be attractive. However, to common buyers who just want extra features, beyond some extra M.2 ports, you can get much the same for less elsewhere.